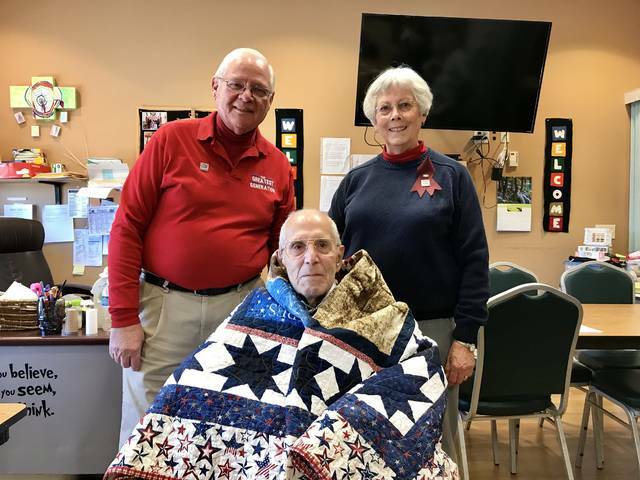 SCRANTON — William Gostomski was recently honored by the Quilts of Valor Foundation in a ceremony at Allied Services Terrace in Scranton, where he is a resident. The Quilts of Valor Foundation is a national organization founded in 2003 by Blue Star mother Catherine Roberts. The foundation’s original mission was to make and award a quilt to comfort service members who suffered physically or psychologically in the Global War on Terror. The foundation has taken on a broader mission to recognize, honor and thank all veterans and current servicemen and women. Quilters throughout the United States work daily to create unique quilts. Born in Scranton in 1923, Gostomski served in the United States Army from 1943-1945. As a member of the 613th Engineers Light Equipment, he served in all five European campaigns — Normandy, Northern France, Battle of the Bulge, Rhineland, and Central Europe – and received the five star European-Africa-Middle East Campaign Medal. During the ceremony, representatives from the Quilts of Valor Foundation shared memories from Gostomski’s time in service with family members, staff members and residents gathered at Allied Services Terrace. Gostomski recalled his time in England and his memories of Victory in Europe day. To date, over 214,000 Quilts of Valor have been awarded in the United States and abroad. According to the Quilts of Valor Foundation, each part of the quilt has significance. The top layer of the quilt represents communities and the individuals who have contributed to it. The filler brings warmth, comfort, peace and healing. The backing is the strength that supports the layers, as the veteran is supported by their family, community and nation. Gostomski’s quilt was pieced by Billie Blakeney of Pennsylvania and quilted by Mary Ames of New Jersey. The quilt presented to Mr. Gostomski came with a certificate from the Quilts of Valor Foundation and is labeled with his name, branch of service, and deployment.